The retroactive increase in the streetcar's 2017 budget comes as Mayor Jenny Durkan considers whether to go forward with a long-planned, but over budget streetcar expansion. 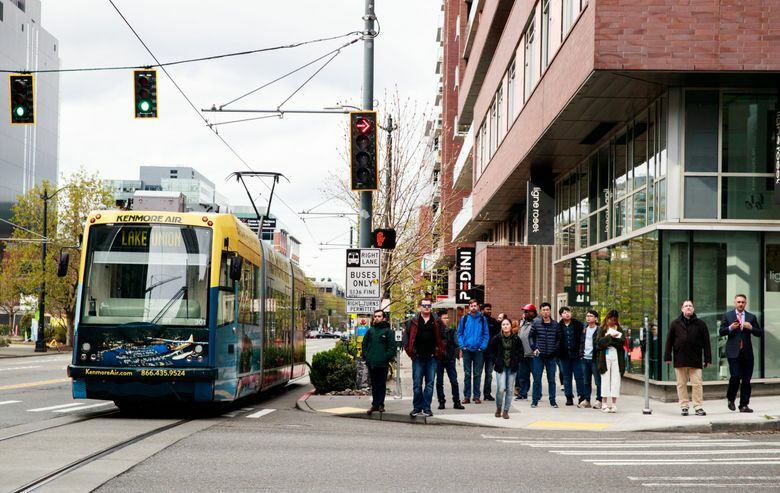 The Seattle Department of Transportation (SDOT) overspent its 2017 budget to operate the South Lake Union streetcar by more than $500,000, requiring the city council to pass legislation to retroactively approve the spending. The overrun isn’t much money compared to the department’s 2017 budget, which totals about $450 million, but it is a substantial portion of the streetcar system’s operating costs. The city budgeted about $6.2 million to operate both the South Lake Union and the First Hill streetcars in 2017. So the cost overrun, for just the South Lake Union streetcar, represents about 8 percent of both streetcars’ operating budgets. SDOT also overspent its 2017 budget by more than $1.6 million, due to trouble with hiring staff to work on construction projects funded by the Move Seattle levy, which was approved by voters in 2015. That levy, the biggest in Seattle’s history, over-promised on what it can deliver and has struggled with delays. Kevin Lo, SDOT’s budget manager, said the $1.6 million deficit stems from the agency’s difficulty in hiring engineers and other staffers for Move Seattle projects. Move Seattle money funds specific projects, but also a small portion of general SDOT work. Because staff for Move Seattle projects was hired more slowly than anticipated, SDOT’s general budget didn’t receive the influx of Move Seattle money that it was expecting, Lo said. “We were anticipating some of the work to happen sooner,” he said. Erik Sund, the city council’s operating-budget coordinator, put it slightly differently. The city council is slated to vote on the budget increases on Monday. The streetcar cost overrun comes as Mayor Jenny Durkan continues to ponder whether or not to expand the streetcar system. In March she halted construction on the First Avenue streetcar after The Seattle Times reported that SDOT may have underestimated the costs to run the new system by as much as 50 percent. Durkan’s self-imposed deadline for completing an outside review of the project came and went in June, but the review is not yet finished. The $200 million streetcar expansion, a half-decade in the making, would connect the existing South Lake Union and First Hill lines, running mostly in its own lanes and enabling a one-seat ride across downtown. The city had essentially secured a $50 million federal grant before the halt in construction, and was hopeful of an additional $25 million in federal money for the project. That money would almost certainly not come to the city if the project is scrapped. The 2017 cost overrun comes from three issues, SDOT said. Labor and professional services costs were higher than budgeted, which accounts for about $200,000. And the agency had to spend an additional $180,000 that should have been included in the budget to comply with a federal grant requirement. SDOT said that an additional $141,000 was not an overrun, but is due to the city’s transition to a new financial system that put the costs in a different fund.